Oops! You made a mistake on your business tax return. Now, what do you do? 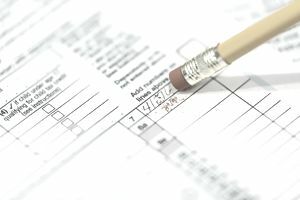 You can file an amended business tax return, but the type of form you file depends on your business type. If your business is a pass-through type, and the tax bill of the business passes through to you on your personal income tax return, you must file an amended personal tax return. The pass-through business types are the sole proprietorship, limited liability company (LLC), partnership, and S corporation. If your business is a corporation, the corporate return must be amended. The specifics of filing an amended tax return for each business type are explained below. When Must I File an Amended Business Tax Return? You made a substantial error on your return, one that will affect your tax liability. You received new information that needs to be included. Your errors were just math errors. The IRS will make the changes. You forgot to attach tax forms. The IRS will ask for these. What's the Deadline for Filing an Amended Business Tax Return? In general, the IRS says you must file the form within three years from the date you filed your original return or with two years from the date you paid the tax, whichever is later. If you must pay more taxes, file the amended return as soon as possible to avoid fines and penalties. If you are due a refund as a result of the amended return, you have three years from the date you filed your original return to claim the refund. What Form Do I Use for an Amended Business Tax Return? For a sole proprietor or single-member LLC filing an amended return on Form 1040x. This form includes changes to Schedule C.
Where to File: You cannot e-file an amended return. Send the return, along with any schedules that changed, to the appropriate address on Page 4 of the Instructions for Form 1040x. When to File: You must wait until the original return has been filed before you file an amended return. For a credit or refund, you must file within 3 years (including extensions) after the date you filed your original return or within 2 years after the date you paid the tax, whichever is later. Where to File: Send the return, along with any schedules that changed, to the address where you filed your original corporate tax return. You can find this address on Page 3 of the Instructions for Form 1120. Where to File: You cannot e-file an amended return. Send the return, along with any schedules that changed, to the address where the original return was filed. You can find this address on the Instructions for Form 1065. Where to File: You cannot e-file an amended return. Send the return, along with any schedules that changed, to the address where the original S corporation tax return was file. You can find the appropriate address on Page 3 of the Instructions for Form 1120s.